There must be something in the water in the Texas Panhandle. Something must explain what I saw beside the road as I drove past Amarillo. 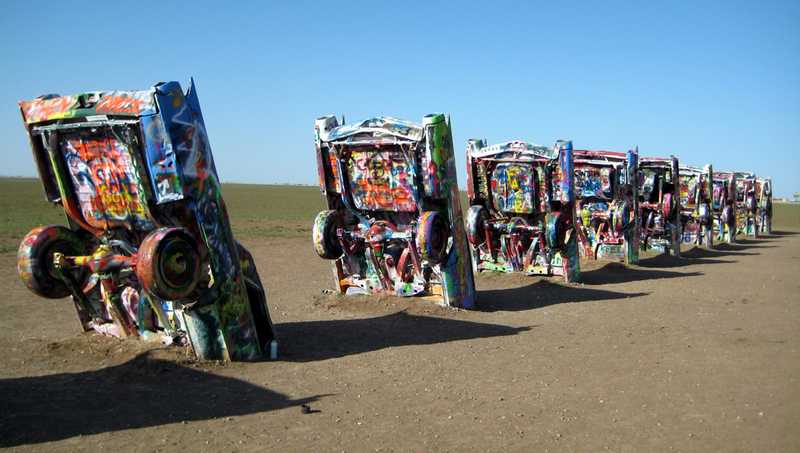 First came the Cadillac Ranch, a series of 10 Caddies buried front-end down in the dirt in a cornfield just west of Amarillo. It is not an officially sanctioned tourist location, says the nice man at the tourist info stop. But it seems as if there is always someone there, gawking at the Texas equivalent of Stonehenge. It was built in 1974 by a group of San Francisco architects who called themselves the Ant Farm and was bankrolled by Amarillo millionaire and TV station owner Stanley Marsh. Marsh, known as something of an eccentric, believed in public art with a sense of humor. He has also been responsible for a farm-field-size ”soft pool table”; a monument at the ”Grave of the Unknown Pet”; and a wood-frame ”Boot Hill” to which hundreds of old boots have been nailed. His most recent project has been a ”drive-by art gallery” called the Dynamite Museum. So, in 1974, he commissioned the Ant Farm to bury 10 Cadillacs — vintages 1949, ’52, ’54, ’56, ’57, ’58, ’59, ’60, ’62 and ’64 — grille down and tail fins flashing. The cars are now pretty rusted out. There is no more window glass, no upholstery. Only the metal and most of the tires, which spin when a breeze catches them. The original Body-by-Fischer paint job has been superseded by layers of graffiti, all brightly colored, leaving the calling card of many of the monument’s visitors. There is surprisingly little obscenity. Almost all the writing is of the Kilroy sort, ”We passed through, these are our names and the towns we live in.” I spotted listings from Sierra Vista and Tempe, among the many from other states and countries. The cars, which, despite the oft-repeated claim, the artists deny are set at the same angle as the side of Cheops’ pyramid, are at the end of a dirt path a 10th of a mile into a working cornfield. The green stalks are all around. In the shade of two of the angles, corn is growing between the axles. 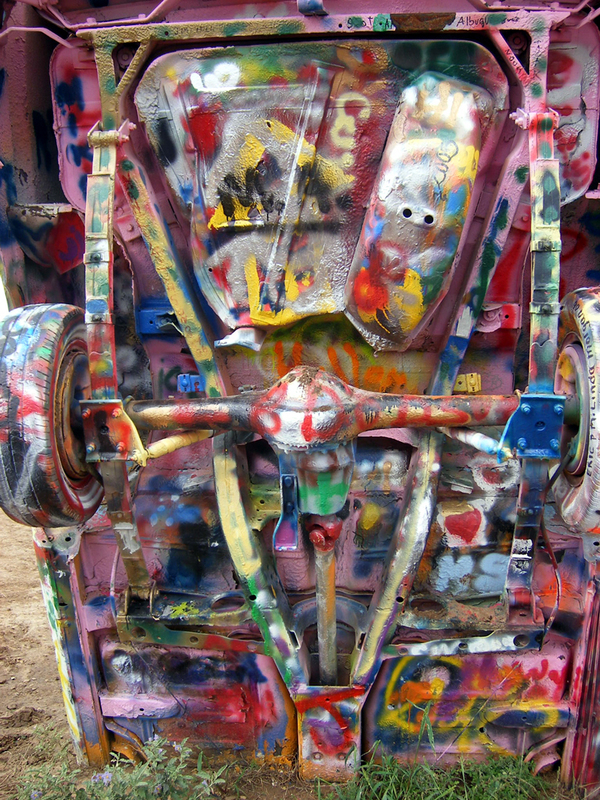 The only ugly thing — as long as you don’t consider the whole thing ugly, as I know many people do — is the mess of spray-paint cans. Many are tossed into the passenger compartments and pile up next to where the steering wheels used to be, among some empty Budweiser cans. But even more of them litter the cornfields, tossed out there when they empty up. I don’t know how the farmer feels about the mess, but I thought it went completely against the spirit of the monument, which is otherwise a collective paean to the American spirit of On-the-Roadness. 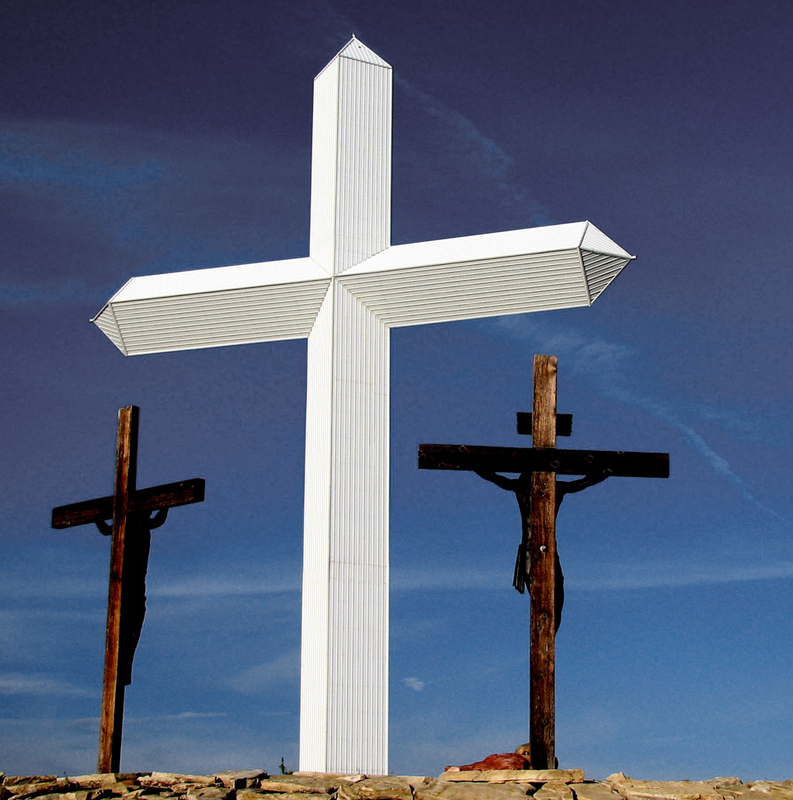 But, although the Cadillac Ranch is the most famous Amarillo monument, it isn’t the only one: On the eastern side of Amarillo, I spotted a huge white cross beside the interstate. It must have been a hundred feet tall and made out of what looked like aluminum siding. At least it had that flat, white paint job and siding grooves. It has smaller crosses on either side whose function is to hold up the spotlights that illuminate the thing at night. I must admit, I felt something less than admiration for it, perhaps because the last time I saw a huge, illuminated cross, it was at a Ku Klux Klan meeting. It was also impressive, but it certainly stood for something I find less than admirable. 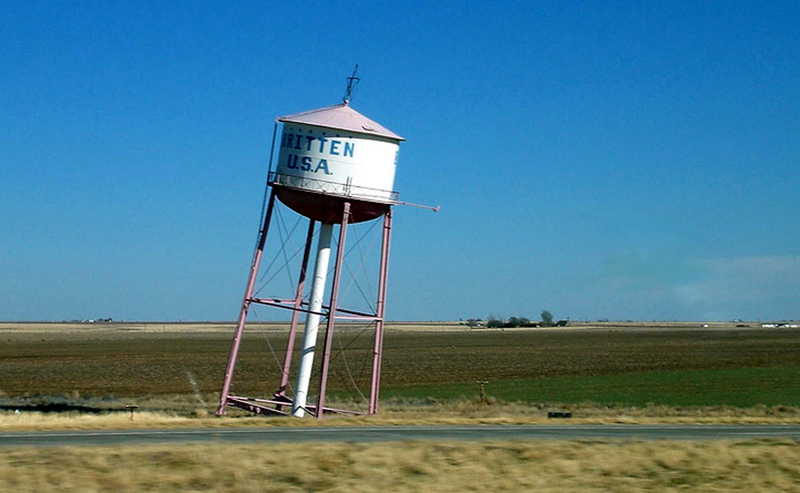 And less than a mile to the east, Britten, Texas, has a roadside water tower set into the ground at something more believably like the Cheops angle. It nods over, like a drunk on his barstool. I can’t tell if the water tank on top is functional or not, but I rather doubt it. It seems more like another American eccentric creating a memorable roadside monument. we stayed in the RV park right to the west of the ranch for 2 weeks this spring and I can tell you that there is a constant stream of people there all day and the “art” changes on an almost daily basis. A local art dealer familiar with the operation told us that they have people clean out the discarded spray cans a couple of times a week.